Matthew DeCapua and Fiona Mongillo in The Enchantment. Photo by Katrin Talbot. BOTTOM LINE: Ducdame Ensemble's production of this Scandinavian classic brings attention to the danger of obsession yet only scratches the surface of the problematic gender roles from a bygone era. Before Hedda (Gabler) and (Miss) Julie, there was Louise, the 32-year-old Swedish girl whose life was forever changed by a man with intoxicating charms, an artist who enraptured the small town recluse with an unfamiliar philosophy and a world of passion she had never tasted before. Such is the tale of The Enchantment, a semi-autobiographical play by Victoria Benedictsson, a Swedish author often regarded as an early feminist who killed herself in 1888 at the age of 38. The Enchantment starts in a Parisian artist’s studio where Louise (Fiona Mongillo) currently resides. The ground has seen some vigorous Pollock-style painting; what’s more, the furniture is draped with sheets splattered with layers of paint. Although this set dressing makes obvious the setting of the play, it seems like overkill. After all, Louise, not a painter herself, probably wouldn’t need to protect her furniture while not painting. It looks also slightly unnatural for her to be resting on a couch covered with a paint-splattered drape. Louise, a gentle soul with a weak constitution, is recovering from an illness that’s probably more psychological than physical when acclaimed sculptor Alland (Matthew DeCapua) drops in for a visit. From then on it’s very much like an elaborate version of the Nina/Trigorin story, removed from Russian suburbia to rural Europe and Paris “Cosmopolitan” France, connected by a train that carries each of the characters’ dreams. We witness the transformation of Louise in the intimately set stage. 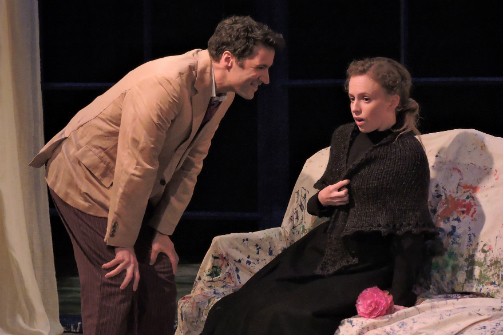 Like the life of a flower, Louise grows from a shy girl resembling Laura in The Glass Menagerie to a desperate, lovesick woman who, for the first time in her life, feels the need to become beautiful. By the play's end, she is a radiant object of affection, albeit one carrying a newfound acceptance of her fate. The play's romance, or rather, the relationship between Louise and Alland, is painfully misogynistic, reflecting a bygone era while sadly ringing true even today. Furthermore, the different stereotyped gender roles of men and women are constantly repeated and reinforced in the play, however not in a way that serves as commentary. It’s a toxic fairytale story of a sheltered princess being emotionally “rescued” by a dark prince. In this version, the artist who doesn’t believe in commitment sweeps the love-thirsty girl off her feet and then wounds her with his Libertine lifestyle. What’s fascinating is that he owns his Casanova persona, and makes it bluntly clear from the beginning. The themes of the play, however, are too dated to feel relatable. The female characters are passive, hopeless flowers who only flourish with the love of a man. Even the ostensibly career-oriented Erna (Jane May), an artist in her own right who is increasingly dissatisfied by her current relationship, becomes miserable and bitter as she pines for her lost love. The evolution of Louise coincides with the disintegration of Erna's life because of the enchantment of one man’s love. The production is well staged by director Lucy Jane Atkinson and is performed by a team of committed actors. May's nuanced portrayal of Erna brings complexity to an otherwise unconvincing character. The subtle and delightful chemistry between Louise and her responsible and devoted step-brother Viggo (Paul Herbig) is another highlight of the show. In fact, Herbig’s boisterous and good-natured Viggo might be the most likable character in the play. There is, of course, some value in looking at the messages the play seems to propagate as a cautionary tale from a bygone era, and seeing the characters as mirrors of a reality not worth emulating. The Enchantment is by Victoria Benedictsson. Adapted and Translated by Tommy Lexen. Directed by Lucy Jane Atkinson. Costume Design is by Adrienne Carlile. Scenic Design is by Mary Hamrick. Lighting Design is by Morgan Zipf-Meister. Stage Management is by Chiara Johnson. The cast is Michael J. Connolly, Claire Curtis-Ward, Matthew DeCapua, Paul Herbig, Ariana Karp, Jane May, Fiona Mongillo, and Nicholas Koy Santillo.